That pithy little emphasized sentence above is the scientific equivalent of constructing a late-game, come-from-behind, potentially-game-winning NFL drive that started on your team’s own ten-yard line, culminating in a 3rd-and-long breakout run during which your guys fumble the f*cking ball at the goal-line and emerge with a heartbreaking loss. This is because there is a wealth of health-related insight that could come out of the Lancet study, and they chose to focus on the one aspect that the data don’t actually support directly; that conclusion is controversial at best, and is only loosely inferred from the analysis, based on the facts and results cited in the very study itself. Vox’s Julia Belluz has executed a well-researched and thoughtfully-entertaining takedown of the recent Lancet study, and it’s well worth a read, especially if you’re among the paints-soiling numbers who kind of freaked out about not being able to drink ever again. As you can see above, the difference in cumulative relative health risks between having zero drinks and having one drink daily is reeeeeaaaalllly small. In fact, statistically it could be argued that the difference is within error margins; in other words, it’s almost zero. But if you want to play the statistical numbers, all things being equal health-wise you’re no worse off drinking in moderation than you are not drinking at all. 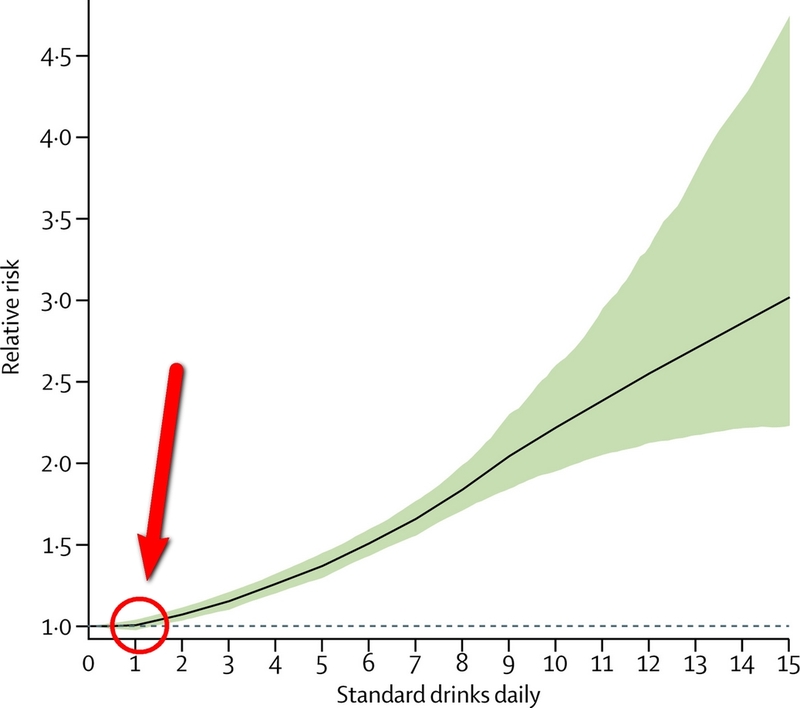 And that conclusion is more-or-less just as valid based on the findings of the Lancet study as their conclusion that you should never drink if you want to reduce your overall health risk.